Today I begin the self-drive safari through parts of Namibia. I arrived in Windhoek yesterday and checked into the Rivendell Hotel. I had time to explore the city and have dinner at a local restaurant, but I’m anxious to get on the road. Sometimes it’s easy to forget where I am when I’m in hotels and restaurants. It still doesn’t seem real, but riding down the dirt road in the middle of a heard of elephants or a pride of lions or sitting at a waterhole across from a cheetah is pretty unmistakable. This is what dreams are made of. It’s cold this morning, maybe below freezing, and I’m confused what time and date it is, but as I wait for the jeep to arrive, I’m filled with so much excitement and anticipation that it’s better than all of my Christmas Eves combined. This is Namibia and I’m finally going on an African safari. This entry was posted in Africa, Namibia, Travel and tagged adventure, Africa, bucketlist, life, Safari, travel by lesleycarter. Bookmark the permalink. Woohoo ! Enjoy the jungle of life..
Have fun. I’m looking forward to your posts about the trip. I went on a few safaris in Kenya and Tanzania and it was LIFE CHANGING!!!! Enjoy every moment…especially when it gets really quiet, no animals are around, and you are just one with nature. How exciting! Have a wonderful time! 🙂 Is Athena staying at home this time? Athena is at home, but I’m starting to think I could have brought her. They have been watching out for us today! I saw everything I dreamed of seeing and more. What an amazing adventure, my favorite to date. What’s your favorite destination so far? Fantastic, looking forward to hearing about it ! The most perfect place I think I’ve been to, if only for Windhoek lager. Namibia is the place I want to revisit most of all. Enjoy. Me too! I’m in love. I can’t wait to bring my family back and do more of the south. There’s so much to see and do that I could never do it all in one trip. What’s your favorite area? I stayed in a place called the Waterberg Plateau and nowhere I’ve been to has touched. It’s like an island in the middle of th savannah, surrounded by lightning storms and rumbles of antelopes. Honeymoon (the first time, 25 years ago) to Kenya and a trucking/camping trip through east Africa which was awesome – visiting Zimbabwe Zambia Malawi, Tanzania Kenya and Zanzibar. Watching you carefully. We’re going on safari in September! I’m not surprised you can forget where you are sometimes. You’ve been going pretty strong lately. Wow! Beautiful. Can’t wait to hear more about the adventure! Welcome to Southern Africa, once it’s in your blood you won’t be able to get it out. Welcome to Southern Africa. Once it’s in your blood you won’t get it out. Namibia is brilliant and so much more to explore. Enjoy the journey. Fantastic! Have a great time and post many photos. 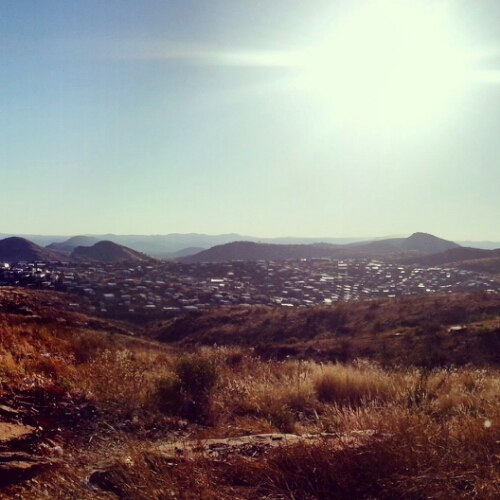 I haven’t been to Windhoek since 1993; I wager it’s changed quite a bit! Where are you going to safari? I highly recommend the Etosha Pan if you have time, and Swakopmund is far more than the place where Angelina Jolie had her baby. I went on safari two years ago through Namibia and Botswana, but on a tour. Very impressive that you are driving it. We had a wonderful day in Windhoek as we hooked up with a local cab driver who took us to all of his local haunts- we went to museum, his cousin’s bar (think aluminum siding with a light bulbs hanging from extensions cords), and to an amazing open air market with some of the loveliest people and kids (the most beautiful children) I have ever seen. Can’t wait to read about your exploration (your not going to the red sands, are you?)! I can imagine 🙂 I was in Masai Mara last year; Out of the world ! Enjoy every moment! Rivendell is a great place to start your journey….. Thank you for those kind and nice things you’ve said about Namibia. This country is in my bucket list along with Tanzania and Kenya. Your writing is feeling me with excitement. What an amazing trek. Having fun :-D!! !